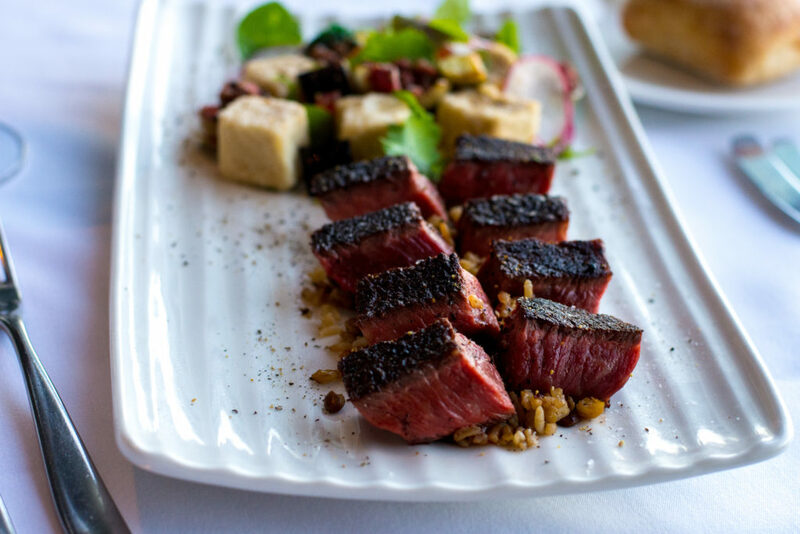 This Japanese inspired dish comes from John Kilroy’s passion for Wagyu. The dish was conceived when Cha Cha Char opened in 1997 and has stood the test of time, through various chefs, ever-changing food trends and pre-social media. This was a time when Wagyu beef was not mainstream, and a generation of chefs were awaking to a new whole world of marbling. Using a sharp knife, place the rump on the cutting board so that the grain of the meat runs horizontally in front of you. Against the grain, cut the rump cap into 4 even slices. Into a heavy based pan, place 100ml of oil. Sear the beef until it is caramelised on both sides. Rest. In a small sauce pan, heat 200ml of vegetable oil for deep frying. Dust the tofu in the rice flour then fry until the coating is crispy. Drain. Season with salt and pepper. Fry the eggplant in the same oil until soft. Drain, then season with salt and sprinkle with the sesame seeds. Blend the smoked eel and teriyaki sauce. Reserve. Mix the flour and soda water together to make a quick batter. Dip the wasabi leaves into the batter then fry in the same oil until crispy. Cut the rump into square cubes, dip into the eel sauce to lightly coat then place on the plate. Place the tofu and eggplant onto the plate then drizzle the eel sauce over the eggplant and around the plate. Garnish with the wasabi leaves.